Improvements in all areas of language: there is a lot of research into the effects of reading as part of language learning which shows that reading comprehension, vocabulary, speaking, fluency and writing skills are improved through reading activities. Lesson variety: kids have short attention spans so variety is the key to a successful, fun lesson. Having a reading component with fun stories is a great way to add variety to your lessons. Attention grabbing: in my experience, this resource above all others captures my students’ attention quickly and maintains focus. Having fun, interactive stories keeps your students’ interest levels high. Vocabulary building: readers are great for reinforcing vocabulary taught in your lessons and also for introducing new vocab. In addition, you may have noticed that many stories for kids contain repetitive phrases (e.g. “I’ll huff and I’ll puff and I’ll blow your house down!”) which are fun to all chant together in class – this is wonderful for building phrases that children can use and adapt. Natural grammar learning: all language hinges on grammar rules. You can’t force grammar rules onto small kids but by exposing them to stories they unconsciously pick up the nuances of grammar within the phrases of the story. For example, a story that contains the repeated phrase “I am a (dog, cat, bird, boy, girl, etc. )” will, without being explicit, teach and reinforce the 1st person present simple tense with ‘to be’. Classroom speaking and discussion: even with the youngest students, using a classroom reader in an interactive manner will naturally encourage speaking. Kids love to talk and ask about what is going on in the story. As the story teller, encouraging speaking and asking lots of questions can bring the classroom experience to life. In turn, this builds on many communication skills such as questions formation, giving opinions, agreeing and disagreeing, predicting, making suggestions, giving advice, using positive and negative forms, talking about likes and dislikes … the list is endless. Before the reading section of the lesson: the lesson theme is introduced, vocabulary is taught and activities using the target vocab have been played. By this stage, students are beginning to internalize and use the target vocab. The reader will help to further reinforce the target vocab and possibly introduce new vocab. 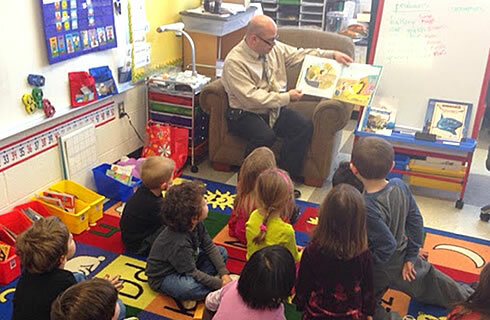 Pre-reading: indicate that it is story time and all students sit down. Show the front cover of the reader to your students and elicit as much vocab as possible using the picture, title and prediction. For example, for our reader “Fruit Salad” (lesson theme: fruit) show the cover picture and elicit what it is (a strawberry). If students are able, ask them to read the title (if not, tell the students the title) and elicit what fruit salad is: a bowl of mixed fruit, often served with cream. In the case of this story, a jug of cream is a key vocab item, so pre-teach “jug” and “cream” by drawing on the board and doing actions. Ask if your students like fruit salad and ask if they pour cream from a jug onto it. Next, ask if a strawberry is a fruit. Then tell them that this story is about different kinds of fruit and ask “What different kinds of fruit do you think will be in the story?”. By now, students will have a good idea of what is coming and much of the key vocab has been elicited. There will also be a sense of anticipation as students will want to find out if their predictions are true (which creates a motivation for focusing on the story). Elicit as much vocab from the pictures as you can. On page 1, elicit again that it is a strawberry and ask if it is little or big. Then read the text. On page 2 elicit “jug of cream” and the verb “push” by asking what he is doing. Ask for predictions: always try and get students to predict, so there is continuous interest in the story. On page 2, ask why the students think the strawberry is pushing the jug of cream (if you are curious, he wants to fill a bowl full of cream so that he and his fruit friends can jump in and swim, hence “fruit salad”). Elicit additional information: ask as many questions as you can using the pictures, and try and use different question types (e.g. wh questions, yes/no questions). On page 1, ask “Is the strawberry happy/sad?”, “What is he doing?” (waving hello, smiling), “What color is he?” (red, with a green stem), etc. You can even be inventive: “He has a mouth and eyes, but what’s missing?” (a nose and ears), “What is his name … something beginning with S?” (elicit any name such as Sam … this is fun to do if the characters don’t have names in the story). On page 2, ask about the color of the jug, and if students think it is full (probably, as it is too heavy for the strawberry to push). Ask what he can do to push the jug (get help from his fruit friends). In the following pages, get students to predict which fruit will help next (e.g. on page 3 it is the apple who helps). Encourage reading: much of this depends on your students reading ability. – Strong readers can “help” the teacher to read, either by all reading out loud together or by having individual students read a sentence each. – intermediate readers can help read target vocab, such as “strawberry” on page 1. A great way to encourage reading is to ask a question and get students to find answers to your questions (e.g. on page 1, ask “Is the strawberry big?” and point to the word “little” – help with sounds until the answer is given). – beginning readers can practice letters, such as pointing to “s” and asking what letter and sound it makes. Then elicit other words with the “s” sound (e.g. snake). This is a great way to reinforce any alphabet learning you are doing in the lesson. Below is an example of how the first page can be read with your class using the ideas above. Teacher: Yes, that’s right. And what color is he? Students: Red … and green. Teacher: He is waving. Everyone wave to the strawberry (getting everyone to wave). What do we say when we wave? Teacher: Yes, that’s right! He’s very happy. Now, is he a big strawberry? Teacher: Really? What do you think Student B? Is he big? Teacher: Ok, let’s check (pointing at the word “little”). What does this word say? Students: (reading) li … tt .. Little! Teacher: Yes, good job! He’s a little strawberry! Ok, let’s read (pointing to each word as reading) “It’s a little strawberry. Hello strawberry!”. As you can see, there is a lot more going on than just reading! With practice, a teacher can come up with these interactive skills without thinking, but for inexperienced teachers it is worthwhile spending a few minutes planning for each reading session. students will need to vocalize as they read (which helps with fluency and pronunciation). students can help each other with difficult words or corrections. A good tactic is to pair up stronger with weaker readers. 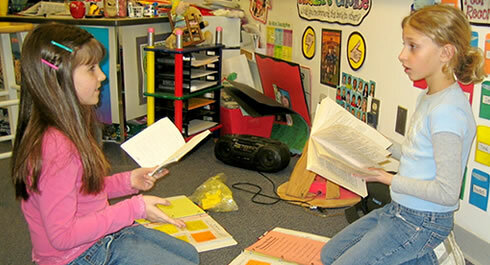 students can work on reading tasks and exercises together. competitions can be set, with each group against the others. each group can have a different reader to read. Each lesson, students remain in the same groups but have a different reader. Pre-reading predictions can be done in groups. Each group has the same reader and everyone looks at the front cover. Ask students prediction questions and allow groups to discuss. Then elicit the predictions and write them on the board. The groups with the correct or closest predictions win points! Groups are given a list of comprehension questions that they need to complete as they read. Do not allow students to read the last page of the reader (cover the page with paper). Students have to create their own last page by writing and drawing. Then each group presents their last page to the class. Finally, everyone reads the last page to see who was closest. Don’t give out any comprehension questions – instead have students write their own questions! Tell each group to write down a set number of questions (e.g. 5 questions) after they have finished reading the story. Then, each group passes their questions to a different group who have to write their answers and then pass back for marking. If each group has a different reader, the questions can be used next lesson when the groups change readers. As the groups are reading and doing their reading tasks, walk around the class and monitor. This gives you the freedom to listen for mistakes and help out with individuals. Also, ask groups questions about what they are reading as you pass from group to group. With small or private classes this can be the best solution. One-on-one with a student allows you to work specifically with the child, working on their weaknesses. Readers can be read by the teacher to the student, asking lots of questions which are covered above in “Using a classroom reader with the whole class” – rather than with a whole class to can use the same reading techniques with an individual student. Alternatively, you can have the student read to the teacher, and the teacher’s role is to help, correct, encourage and reward. Readers are great for homework! If you have enough readers to go around, you can assign a reader to each student every week, then change to a different reader the following week. Let the parents know that you would like them to be involved, either by reading with their child or being read to. Parents usually really appreciate being involved and allows them to see their child’s progress. A great part of your lesson routine can be “Reading time”. You will need enough readers for each student for this to be effective. Either assign readers to students or have them pick out the reader they want to read. Then simply let them have 5 minutes to enjoy reading – let them know that they can ask you questions if they get stuck. After the 5 minutes are up, get students to summarize the story to the class or in small groups / pairs. Include active components to the reading. If the reader has characters doing an action or activity, get the students standing to do the same action. For example, for the Fruit Salad reader, get students up to demonstrate how they would push and heave a heavy jug. In the warm up section of your lesson you can include time for reading a reader from a previous lesson with the whole class. Either choose one yourself or allow a student to come up and choose the reader. Younger kids especially enjoy re-reading favorite stories. For older students, have them write reviews on a reader that they read. These reviews can be placed on the classroom walls or even included in your school magazine. If you have the facilities in your classroom, you can use a computer or projector (or combination of both) to display the reader. For some reason, kids seem to love anything shown on a computer screen! Set up a “readers library” in the classroom. It can be a simple bookshelf with all of your readers. Allow students to pick them up and read before class starts and also allow students to book out readers to take home, like a real library! If you have readers with black and white illustrations (such as the black and white versions of our readers) have students color in the readers themselves. As readers are graded into different levels you can provide incentives for students to read all of the readers in one level. A certificate, such as “Certificate of Reading: Rosa has successfully completed reading all of the books in Level 1!”, is a great way to reward a student. If you download and print readers from the Internet, taking a little bit of time to make them more durable will save you lots of time in the future reprinting. Using card (at least for the covers) will provide some protection. Laminating all of the pages (including the cover) is the most effective method, as this protects against slips, rips, crayons and more! Great ideas! My students love the stories. I have newcomers in NC and they have started to read alone before I thought they could do! I hope you continue creating more lessons and stories. Maybe some science lessons for primary. Thanks for taking your time! Love your ideas!